The Viperinae, or Viperines, are a subfamily of venomous Vipers found in Europe, Asia and Africa.There are currently, 12 genera and 66 species which are recognized of this subfamily. Most are tropical and subtropical, although one species, the Vipera berus, even occurs within the Arctic Circle. Members of this subfamily range in size from the Namaqua Dwarf Adder, that grows to a maximum of 28 cm, to the Gaboon Viper that reaches a maximum length of over 2 m. Most species are terrestrial (living on land), but a few, such as Atheris, are completely arboreal (living in trees). 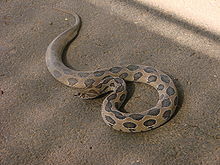 The Viperinae are found in Europe, Asia and Africa, but they are not found in Madagascar. Most of the members of this subfamily are viviparous (ovoviviparous), meaning they give live birth, although a few, such as the Persian Horned viper, lay eggs.